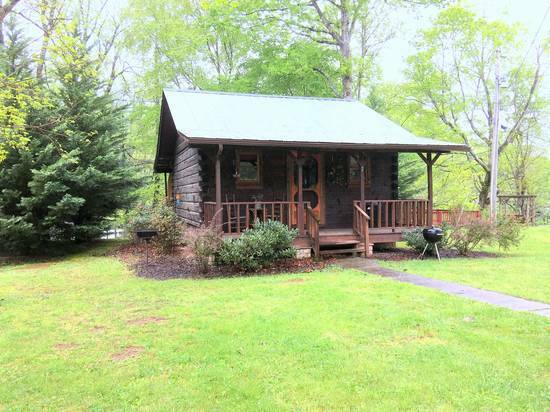 "River Bend" is a cozy, romantic studio cabin located on Little River in Townsend, TN. Known as "The Peaceful Side of the Smokies," Townsend sits next to the national park and is only minutes away from Cades Cove, Gatlinburg and Pigeon Forge. 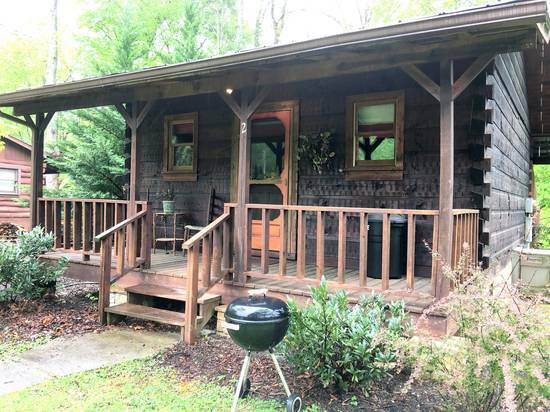 This cabin is located on an easily accessible, quiet circle and sits right next to Little River giving you waterfront property that is 2nd to none. The cabin sits up high over the river but there is lots of joint property river access. Right from the property, you can fish, swim or go tubing. There are so many things to do in Townsend and the national park including hiking, tubing, biking, fishing, browsing the various shops, visiting Cades Cove, picnicking, swimming, visiting the Great Smoky Mountain Heritage Center and attending the various festivals/shows. 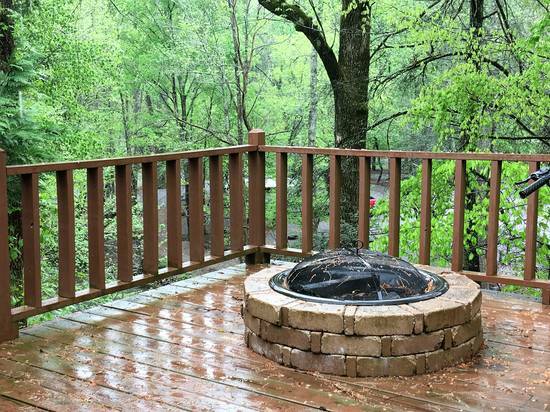 After a busy day of sightseeing, you'll love returning to the warmth and comfort of "River Bend" and relaxing on the back porch or soaking in the tub overlooking Little River. There is also a bonfire pit for your enjoyment. Very nice cabin very relaxing . we are definitely coming back! We absolutely loved our stay here at this cabin. It was the perfect size for the 2 of us, and had everything we could have wanted. The deck overlooking the river was a huge bonus and we spent a lot of evenings and mornings just watching the river. We didn't even mind the campground across the river -- another reviewer mentioned it but we are campers ourselves so we didn't mind at all. Even the people on tubes weren't a bother -- most were just having fun, not out to make noise or cause any problems. The only issue we had with this quaint little cabin was the driveway, or lack thereof. It rained every afternoon while we were there and by the time we left to head home, there was a huge puddle of mud across the whole yard. There was no way around it. A little gravel would go a long way to making this a 5 star review! Oh, and some better back deck patio furniture would be nice, but we really enjoyed the cabin regardless! Management Response: We are having some gravel delivered soon and will look at the patio furniture. Great cabin! Nice and peaceful. The cabin was beautiful and very warm and welcoming! The hot tub was great for relaxing at the end of the day, and the sound of the river was an added bonus. It was a lovely cabin in a beautiful setting. I couldn't fill out the guestbook bc I broke my wrist the day before I arrive. I would recommend this cabin. Absolutely loved it. Management Response: Thank you so much for staying with us Patsy. We hope that your wrist heals quickly!! Thank you so much for a lovely stay! We loved the fireplaces and cabin location - cabin was well supplied and we hope to return another time! Loved this cabin! Perfect getaway for 2. Hopefully we can return soon. Great little cabin. We had a wonderful time. The cabin was very clean and efficient. Everything was just right for a two person getaway. We really enjoyed sitting by the fire of a evening and listening to the river just below us. It rained one night that we were there, and it was so relaxing to listen to it on the metal roof. Cathy Moore was very pleasant and easy to work with. I would highly recommend this cabin to anyone looking for a few days of relaxation. A wonderful stay - we enjoyed the cabin very much! The cabin was great. We enjoyed our stay, very peaceful and relaxing. Cute cabin. Great view by the river on the back deck. Nice cozy cabin for two. High view of the river and a nice back deck and hot tub.our suggestion to make this a 5 star stay would be to have a little place (closet or chest) to unpack your suitcases. 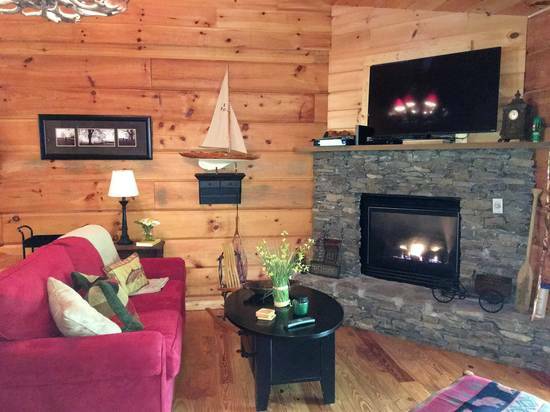 Huge tv and nice gas fireplace. Wonderful place to stay. To make many memories around the fire pit. Enjoying the quality time. Management Response: Thank you Poole Family!! Please come back next year! 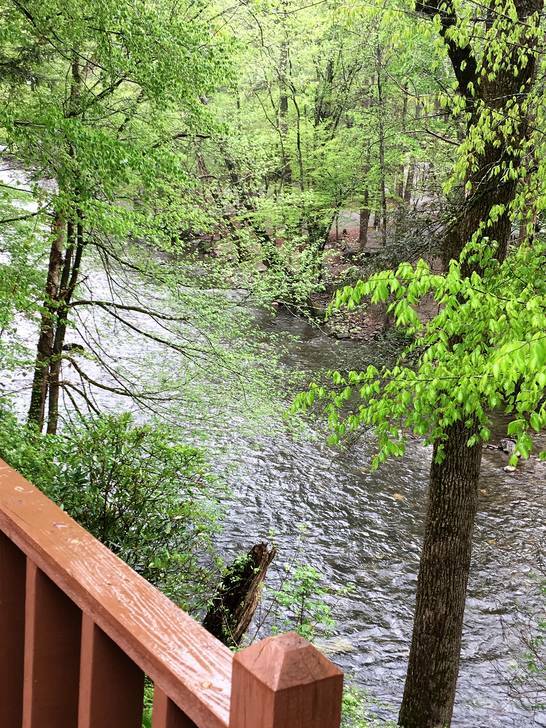 What a great place to relax and get some much needed rest , we loved the deck over looking the river , this cabin was was like our home away from home , we will be coming back soon! Awesome little cabin. Just what we was looking for. We had no phone service much while we was there so that was even better. Didnt get to use hot tub when was planned due to rain but didn't find the switch to turn it on nor for the tub inside. I did not want to leave. Awesome outdoor area. Perfect romantic getaway! This beautiful cozy cabin was our home away from home for a couple of nights. The cabin was super clean and the area was very peaceful. We WILL be making a return visit in the future! Romantic cabin, off the beaten path but close enough to Gatlingberg, Cherokee, Pigeon Forge, Cades Cove. Beautiful cabin enjoyed our stay, it was everything we could possibly want for a mountain getaway. Highly recommend it and we would book this cabin again, thank you. This was a cozy welcoming cabin, perfect for 2!!! We had everything we needed and enjoyed a relaxing week in Townsend! We absolutely LOVED our stay with you all and are already planning our next trip! The cabin was spotless and everything was set up for us perfectly. Thank you so much for an amazing experience! So easy to book, get instructions, and directions. Cabin was WONDERFUL! It was a very good cabin for two people. Very comfortable, in quiet location away from the crowd but with good WIFI and cable to keep in touch.